Enjoy these tacos made with fish, salsa and flour tortillas – it’s a tasty Mexican supper that’s ready in under an hour! Brush the fish fillets with 1 tablespoon of the oil and sprinkle with the cumin, salt and pepper. Set aside. Add the rest of the oil to a large non-stick frying pan and heat over a medium-high heat. Stir in the garlic and cook for 1 minute then add the fish chunks and cook for 5-7 minutes or until the fish flakes easily with a fork. Sprinkle with the lemon juice. 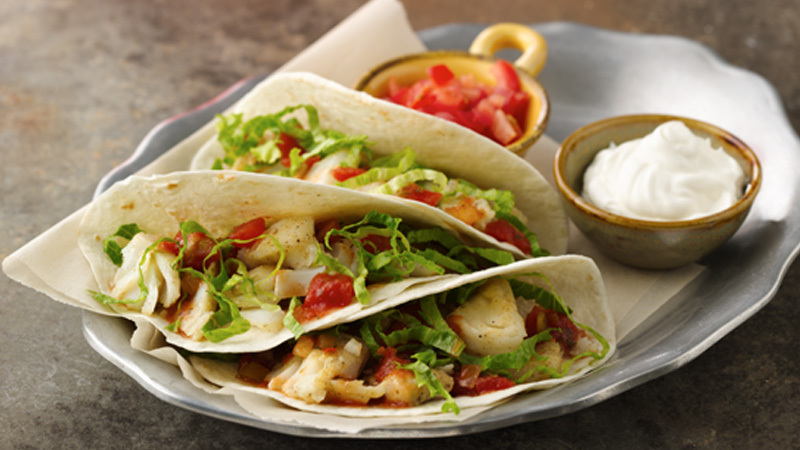 Divide the salsa between the warmed tortillas, top with the flaked fish and shredded lettuce and fold or roll up. Serve with diced tomatoes and soured cream on the side. Chose thick pieces of fish fillet and cut into even sized chunks. When cooking, turn occasionally but don’t stir the chunks or they will break up. Instead of the salsa why not try spreading a little guacamole or mashed avocado on the warmed tortillas.